The title is a reference to two points of the compass. We become aware of points of the compass when we think about where we are situated in relation to somewhere else. When we look towards somewhere else from where we are situated, what point on the compass would that be? Because photography is a medium in which scenes, not of “here and now,” but of “sometime, somewhere” are brought before the viewer’s eyes, it is natural to expect a sense of orientation to be contained in photographs, even where it is uncertain whether that is east or southwest. 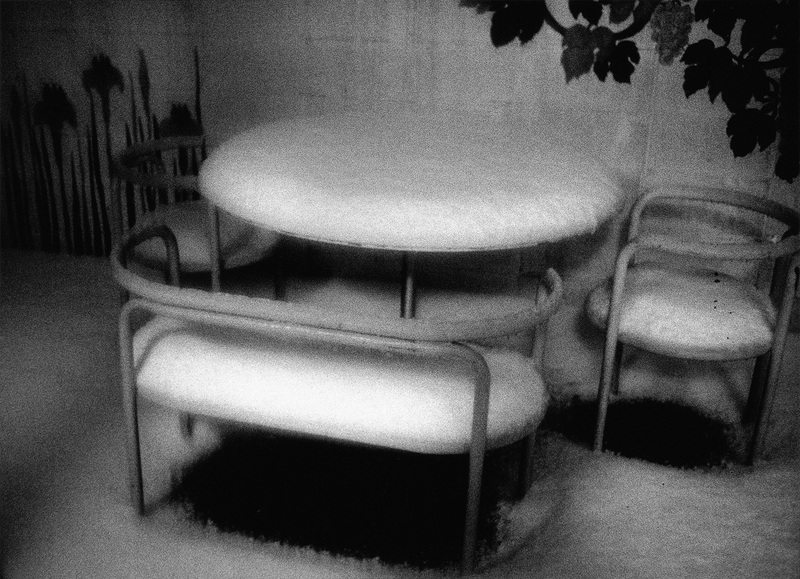 Kozo Miyoshi is a photographer who travels. A large number of his photographs thus far are the product of a process involving some kind of movement, although the distance travelled is may differ. So when one looks at Miyoshi’s photographs, a sense of a direction, a point on a compass is evoked within us to no small extent. In fact, the “east, southwest” referred to at the beginning were the very words printed on the catalogue for and the invitation to Miyoshi’s solo exhibition in the United States titled “Far East and Southwest: The Photography of Kozo Miyoshi” (Center for Creative Photography, The University of Arizona, 1994). 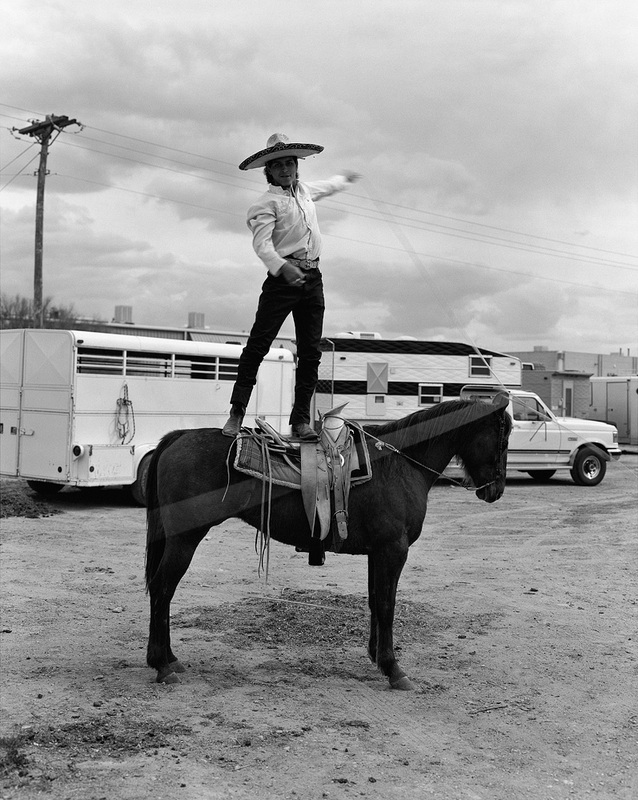 The exhibition consisted of photographs of America, taken while he was based in Tucson, Arizona in the American Southwest. If the title, therefore, were translated correctly, it should have been “Far East and Southwest (US).” The exhibition, held only in the United States, however, was never given an official title in Japanese and the three Japanese characters representing the words “east, south-west” were used liberally as a design element to invoke a sense of the exotic among, in particular the English-speaking audience who were unable to read Japanese. Nevertheless, the three characters, that would be interpreted by people who can read Japanese as merely indicating a point of the compass and not a specific place or location called “Far East, (the US) Southwest,” was thought to be an indication of the essence of Miyoshi’s work. 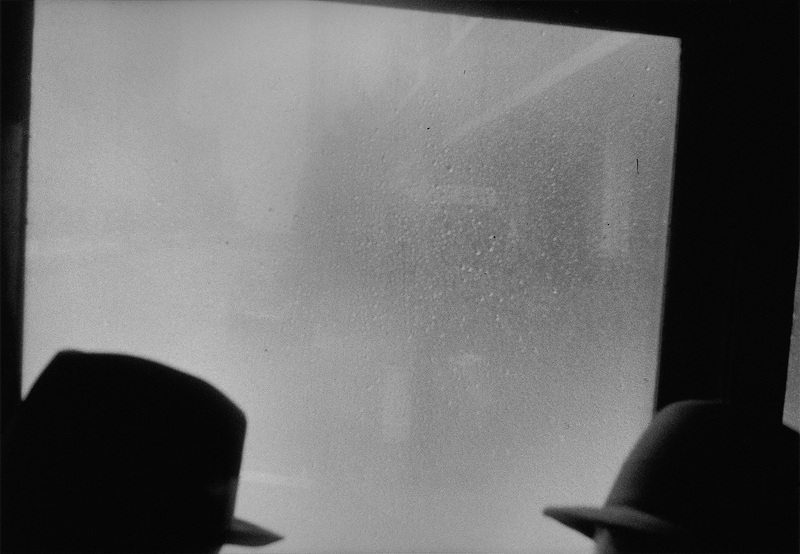 As described above, Miyoshi’s photographs are initiated from the idea of “journey equals movement” but in many cases, it is because, insofar as the journey is towards a specific place or for a specific purpose, it is considered to be for the purpose of encountering the unexpected. In the same way that we set out on a journey with just the means of that movement determined, such as driving a car along a coastline, sometimes the purpose of the journey and the direction in which we are going for the time being seem rather like pretexts. This appears also in the series of photographs he took while driving along Route 66, several of which are featured in this exhibition. Titled “In The Road,” the series is one of Miyoshi’s representative bodies of work from the time, starting in 1991 and lasting six years when he resided in the United States. The road that goes from the large Midwestern city of Chicago to Santa Monica on the Pacific west coast, crossing from one side of the United States to another, has today become a tourist route featuring many historical places and landscapes, filled with well-known things that have become cultural symbols of the United States, seen and heard in literature, television programs and popular music. If this is the theme, a journey that follows the theme is not at all strange even if it takes shape as one mass story. 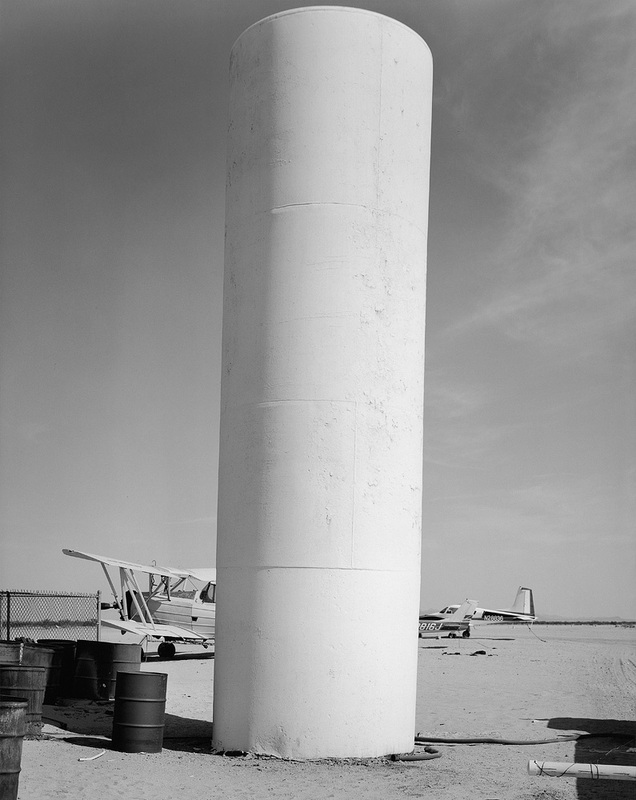 Because Miyoshi, during his time in the United States, shot the photographs for the series while travelling back and forth a number of times on the nearly 4,000 kilometer road, he was able to show the road as a symbol of America at the same time as unearthing its historical and cultural background. But the gaze of the travelling Miyoshi never attempts to occupy a privileged position. He exchanges greetings with the people of the land he visits, asks them for some of their time, quickly sets up a large-format camera, takes some shots, thanks them for their time and then departs. The gaze of the traveler tends to have an out-of-the-ordinary personality, but in Miyoshi’s case, he is always polite, respectful of ordinary time in the lands he visits, and by his behavior shows a willingness to get closer to them. Miyoshi did not necessarily have such a gaze from the very beginning, something that can be understood by comparing his early square-format work also on display at this exhibition. For example, the dance of light spilling from the boardwalk onto the beach and the two men with their eyes glued to a lens, with tetrapods in the background. 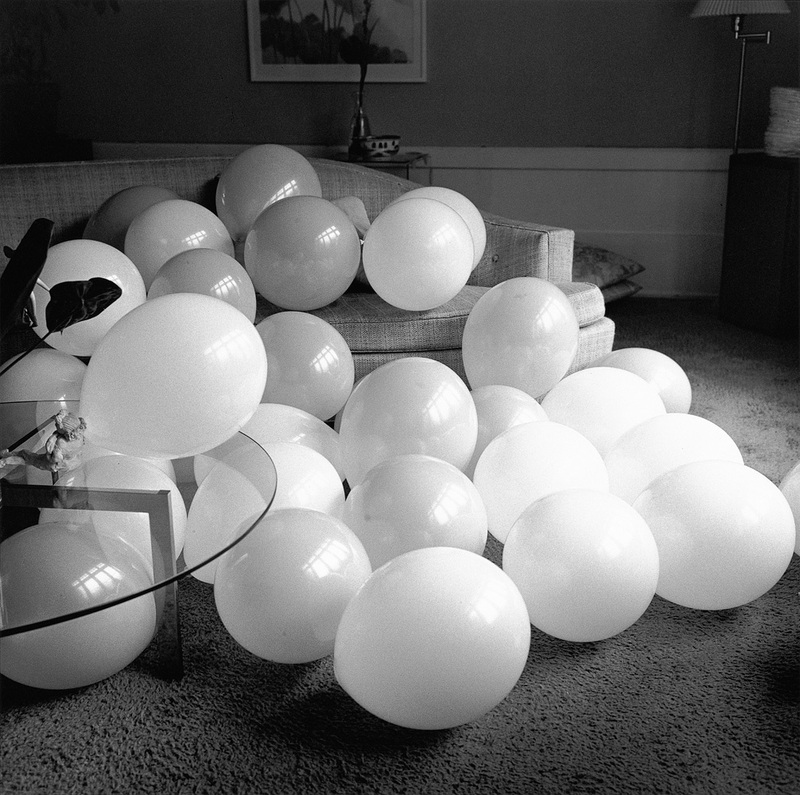 Compared to his later work, each of these early photos is dramatic and fluent. The gaze of the photographer also, as he becomes captivated by something he sees in the scene before him and clicks the shutter, becomes anxious about not letting whatever it is that has revealed itself to him in that moment escape, his senses becoming keener, more active. The difference between the earlier and later photographs is the difference in format, between the hand-held medium-format camera and the large-format camera that Miyoshi places on a tripod, but that is not the only difference. The greenhouse series that he worked on for around ten years starting in the early 1980s shortly after he started using a large-format camera is interesting when considering that transformation. For Miyoshi who comes from a family of horticulturists, the greenhouse is a familiar space and the leading roles in that space are played by the plants that never utter a word. In this space of seeming calmness, isolated from the outside world, various things are in fact happening, and he no doubt intuitively understood the fact that the greenhouse was filled with secret voices, and the fact that, in order to be able to hear those voices, he needed to get closer to the time and the existence of the plants. The way in which plants detect the light, temperature and wind direction in the outside world in a passive way. 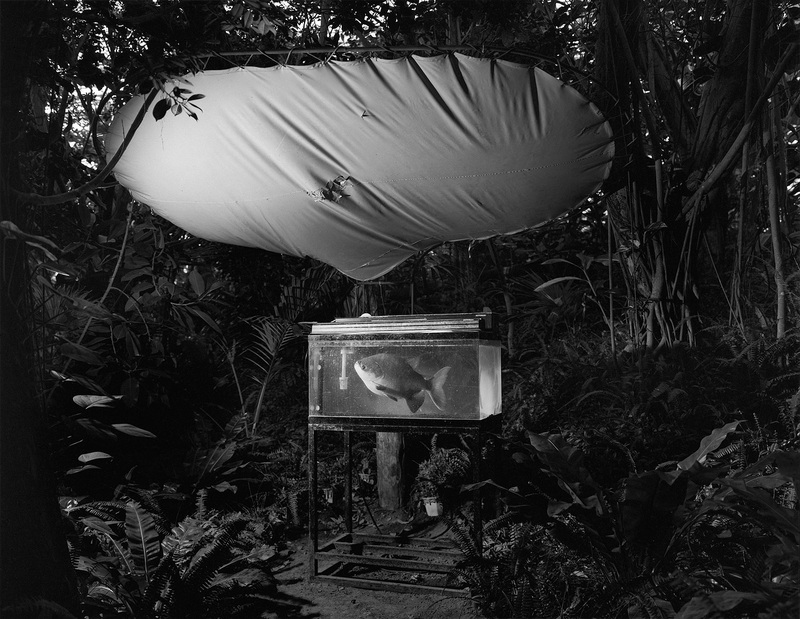 During his journey around the greenhouse, the subjects before him or the way in which they behave in the process of adapting to the air in that place gradually became part of the photographer’s gaze, much like a study of plants. 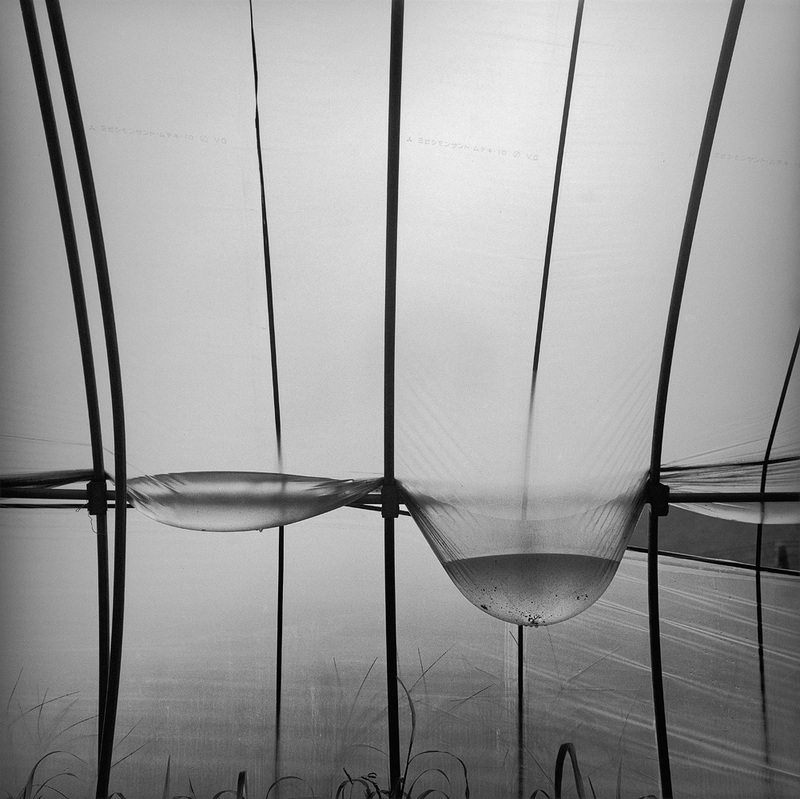 “Roots <NE>” was designed to overlap with the greenhouse series and was noted for the fact that it encouraged the transformation of the gaze. The leading role in “Roots <NE>” is played by daion radishes. 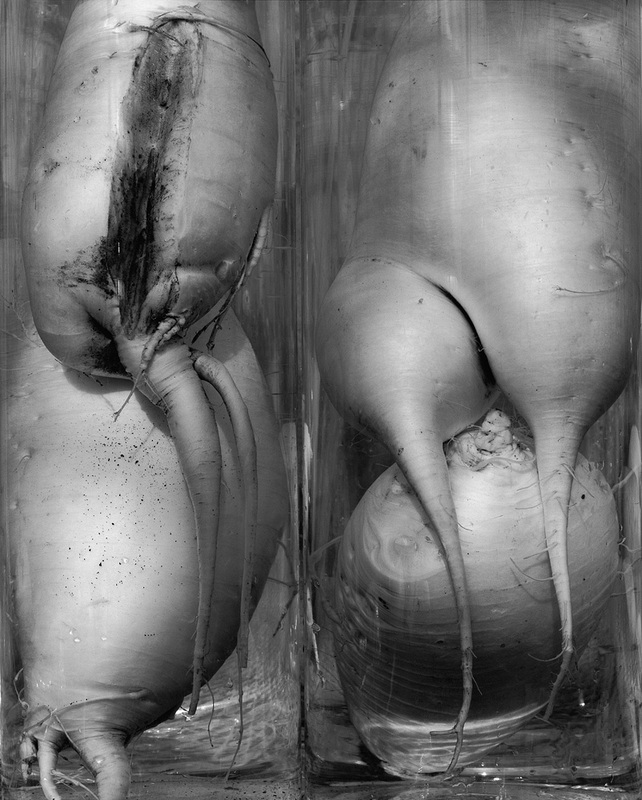 The radishes that fill the entire screen of a large-format camera are plants just like the subjects of the greenhouse series, but they are very eloquent. The photographer’s sometimes overwrought sensitivity that can be seen in his early work has receded and much of “Roots <NE>” is about the way in which the subjects behave. 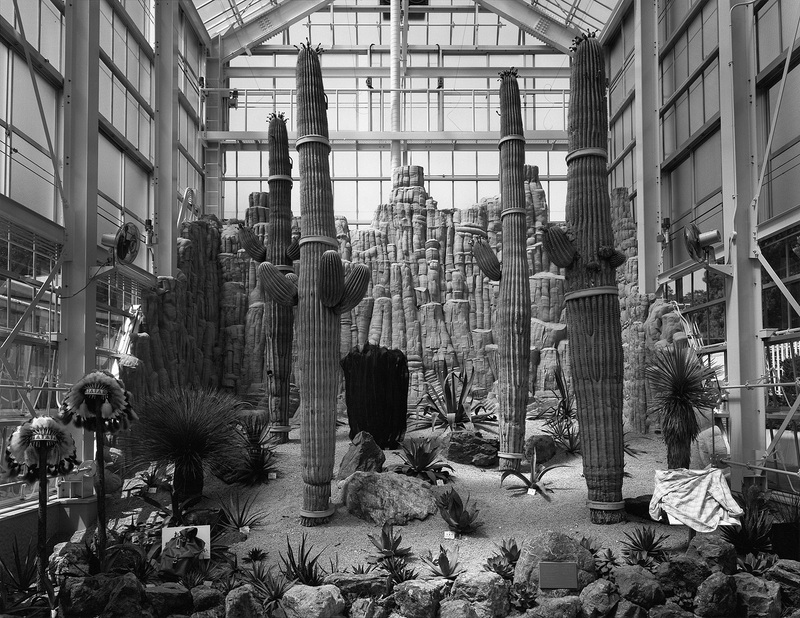 Plants make an appearance as a major motif in his subsequent work, plants such as the giant Saguaro cactus that grows in the desert of Arizona and the cherry trees that entice Miyoshi on a journey each year in springtime. The plants are rooted in the land, where they exist year after year. What Miyoshi directs his gaze at most during his travels is people who have existed year after year, and like the plants, are rooted in their locale, which he thinks he can capture as the landscape that surrounds their lives. The gaze of the travelling photographer has a sense of awe and admiration for those who are rooted in the land where they exist year after year. The time flowing through the photographs is not the out-of-the-ordinary-time placed there by the travelling photographer. It is instead the time transformed into ordinary time, flowing alongside the subject and rooted in the land. It is not only time but also voices heard in the photographs that are ever changing. If anything, in his early photographs, it is only the photographer’s exclamation of wonder, taking a sharp intake of breath upon seeing something of the secret that the world is prepared to disclose for a split second, that seems to echo as a monologue. The photographer turns his ear towards voices and participates in the conversation for a little while. The voices within the photographs are resonating as different sets of dialogue. It is probably better not to have an itinerary or a destination for your journey if you want to get closer to all those different voices. Will it be east? Will it be southwest? He decides on a direction to take for the time being and starts moving. Once he starts moving, the rest is just about going in a forward direction with an open heart and mind and getting closer to the time of whatever he may encounter at any given moment. At this exhibition in which a comparatively large number of his early works will be on display, you will repeatedly hear the exclamation of wonder that the photographer must have released within himself upon encountering the world in a moment that resonated with the gaze and the sensitivity of a young Kozo Miyoshi. You also see the process of transition of Miyoshi’s gaze. Before that, the things that he has encountered are waiting – the things that the travelling eye of a seasoned photographer who becomes acquainted with how the subjects of his photographs behave, and learns the art of adapting to the deep time that is flowing therein. Different voices echo therein, secret voices that become layer upon layer of voices. We of course will be welcome to join the discussion that will become one of those layers. Born 1947. Graduated from the Department of Photography, Nihon University College of Art. Recipient of the 1986 Photographic Society of Japan Newcomer's Award. Remained living in Arizona after a year starting in 1991 at the University of Arizona, Center for Creative Photography under the auspices of the Japanese Agency for Cultural Affairs Overseas Study Program for Artists. Returned in 1996 to Japan, where he is currently based. Recent solo exhibitions include “Yubune” Photo Gallery International (Tokyo, 2013), “Sakura” 1839 Contemporary Gallery (Taipei, 2011), “See Saw” PGI (2010), “Sakura” PGI (2009), “Far and Wide” PGI (2007), “Tokyo Drive” PGI (2006), “Seagirt” PGI (2004), “Sakura” PGI (2003), “CAMERA” PGI (2002), “Tokyo　Street” PGI (1999), and “In The Road” PGI (1997). Participated in “Reinventing Tokyo: Japan’s Largest City in the Artistic Imagination” Amherst College Mead Art Museum (2012). His works are in the collections of the National Museum of Modern Art, Tokyo; Tokyo Metropolitan Museum of Photography; George Eastman House International Museum of Photography and Film (USA); Center for Creative Photography, University of Arizona (USA); and Museum of Fine Arts, Houston (USA) among others. 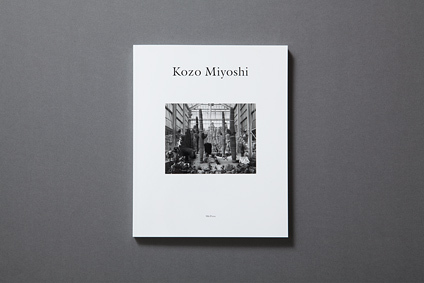 To coincide with the opening of Kozo Miyoshi’s photography exhibition “1972~,” the photography book Kozo Miyoshi is now available.